Looking to expand your business as a vendor? Join here. Looking to plan an EOL service? Join here. Expand your business by putting your services right in front of your audience. Let’s go through what you can expect from a Memoria Marketplace listing, including your Dashboard, Storefront, Messages, Reviews, and Profile. This is where you can keep track of your business in the Marketplace. Keep track of your subscription type and edit all of your business’ information, from name and location to category. See how many visitors you’ve received with detailed metrics reports. 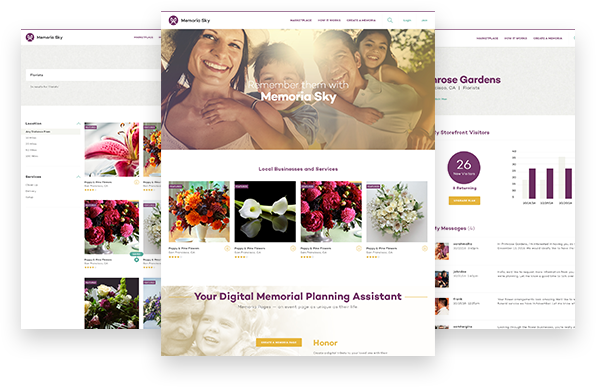 Navigate your entire Memoria Sky experience, including your storefront, messages, and reviews. 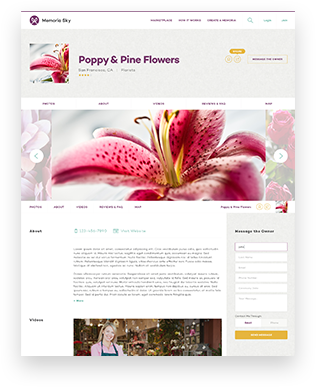 The storefront is where you can display your business front and center for all your visitors to see. Choose an image (or a few) to show off your services. Remember, this is a customer’s first impression of you, so make sure to choose you images carefully. Tell your audience a bit about you, and upload a few videos. Keeping it short increases the likelihood your audience will read everything they need to know. Here’s where your customers can review your services, and where you can answer frequently asked questions. Keep track of your conversations with different customers. 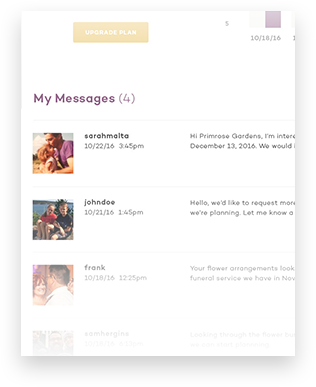 You can exchange messages with your customers, visitors, or other businesses. Whether discussing an estimate, explaining your service, or coordinating logistics for an event, your messages are the easiest way to keep in communication with customers. Build your reputation and connect with customers. 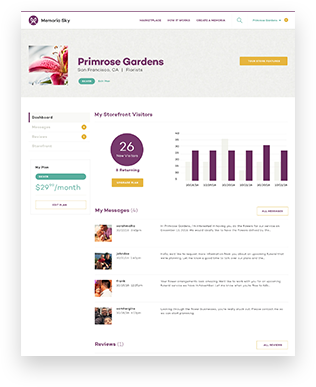 This is where your customers can tell others about their experiences with your business, and where visitors can see first-hand testimonials from real people. 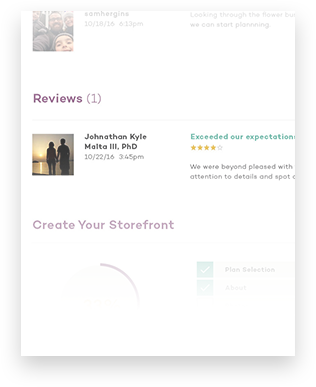 Our review system includes a rating from 1-5 stars, a short message about the customer’s experience, and a feedback system to rank the most helpful reviews.